Western Antarctica, meters from the Onset-D camp, 1125 meters elevation on top of a (very) small hill. When I was preparing to come down to Antarctica in October 2002 for a scientific project I noticed that there were no geocaches in Antarctica. A workmate of mine, Steve Azevedo, convinced me that I should place the first one on the continent. I decided to put in two of them. One in McMurdo and this one out in the middle of nowhere. I ended up planting the one in the middle of nowhere first. This geocache ended up not being the first one, but at the time of it's planting, was the most southern geocache. 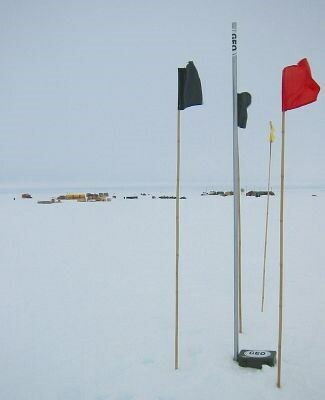 The location of the cache, the Onset-D deep field camp, was set up to support scientific projects working in the area where one of the large ice streams which drain ice from West Antarctica into the Ross Sea (ice stream "D") begins to flow. Field season 2002-2003 was to be the last season for the camp for the foreseeable future, so the cache will be a challenge to get to, though not impossible. More information about the cache and what I was doing at the Onset-D camp in the first place can be seen at www.greschke.com/passcal/antarctica/index.htm. About 250 meters south of the camp's position there were three mounds of snow. The largest was just about 5 meters tall. The geocache was planted on top of the middle mound, which was about 3 meters tall. These mounds were the largest geographical features for about 100 kilometers in every direction. The cache is a small, dark green, metal box. It was attached to a metal conduit pole that is more than 2 meters tall. If the mound does not erode the pole should be visible for more than 5 years. There were 3 bamboo flagpoles surrounding the conduit. The bamboo poles may still be there in 5 years, but the flags probably won't. If you visit the cache please pull everything up a bit to keep the cache near the top of the snow. So what's in the cache? A kayak strap in case global warming has really taken hold and you've arrived by kayak; a pair of boot laces in case you had to walk; a PASSCAL ball cap (where I was working); a magnifying glass in case you have to start a fire -- unless, of course, you arrive during the dark half of the year; a New Mexico post card (where I was living); a drink coaster to put under your celebratory champagne; a tea bag; an E.T. statue that was donated by Doug Ruuska who was working at the Onset-D camp; a strawberry Harvest bar in case you are really desperate for something to eat when you arrive. Last, but not least, there is a Chilly Willy doll with travel bug #316069 attached. As you may know from the cartoons, Chilly Willy doesn't like the cold, so if you plan on being the first person to visit the cache do it quickly to get him and the travel bug out of there fast! 2005JUN02 - Updated the position to a waypoint I recorded when I was at Byrd Surface Camp where ekendrick was kind enough to have left the cache when it was moved. The lat/long should be close, but if you actually make it to the camp you probably won't need the coordinates.